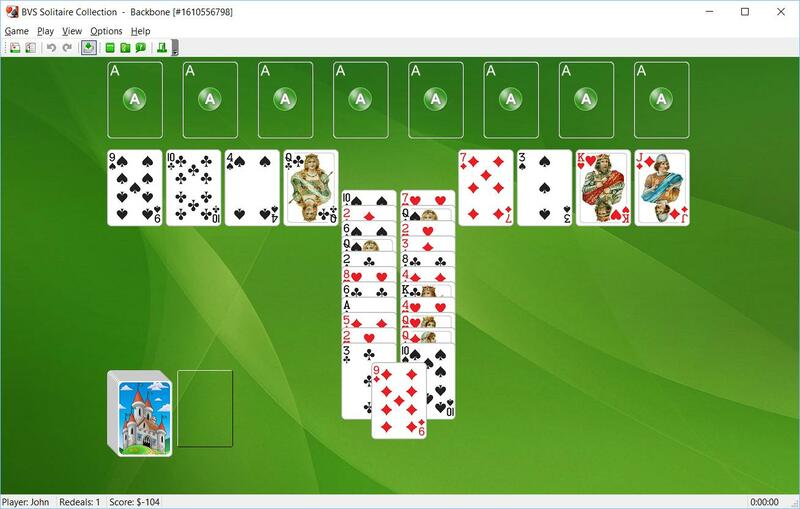 Backbone Solitaire uses 104 cards (2 decks). 22 cards ("backbone") are dealt into 2 reserve piles. The 23rd card is dealt overlapping both reserve piles at their lower end (if this card is a King it is replaced by another card). 8 tableau piles with one card per pile are dealt to the left and to the right of the "backbone". The top card of each tableau pile, uncovered cards of "Backbone" and waste are available for play. You can move cards from the waste and "Backbone" to the tableau piles and to the foundations. You should build tableau piles down in suit. Only one card card at a time can be moved from pile to pile. When any tableaus are empty you can fill the space with any available card from another tableau pile, "Backbone" or the waste pile.